When I think about the Central Limit Theorem (CLT), bunnies and dragons are just about the last things that come to mind. 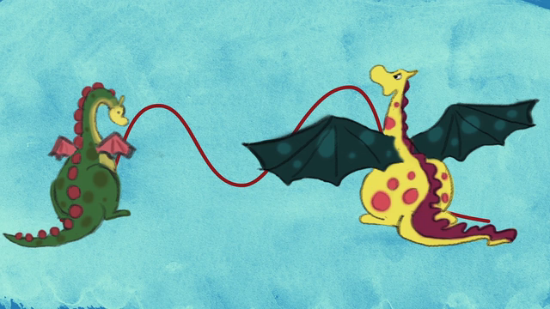 However, that’s not the case for Shuyi Chiou, whose playful CreatureCast.org animation explains the CLT using both fluffy and fire-breathing creatures. “Many real-world observations can be approximated by, and tested against, the same expected pattern: the normal distribution. In this familiar symmetric bell-shaped pattern, most observations are close to average, and there are fewer observations further from the average. The size of flowers, the physiological response to a drug, the breaking force in a batch of steel cables — these and other observations often fit a normal distribution. There are, however, many important things we would like to measure and test that do not follow a normal distribution. Household income doesn’t – high values are much further from the average than low values are. Some data sets follow a normal distribution. Others do not. However for both normal AND nonnormal data, if we repeatedly take independent random samples of size n from a population, then when n is large, the distribution of the sample means will approach a normal distribution. How large is large enough? Well, it depends. The closer the population distribution is to a normal distribution, the fewer samples you need to take to demonstrate the theorem. Populations that are heavily skewed or have several modes may require larger sample sizes. Want to See the CLT in Action? In case you don’t have any fire-breathing dragons at your disposal, you can use Minitab Statistical Software to simulate the scenarios the animation describes and see the CLT in action. So let’s see the CLT in action. 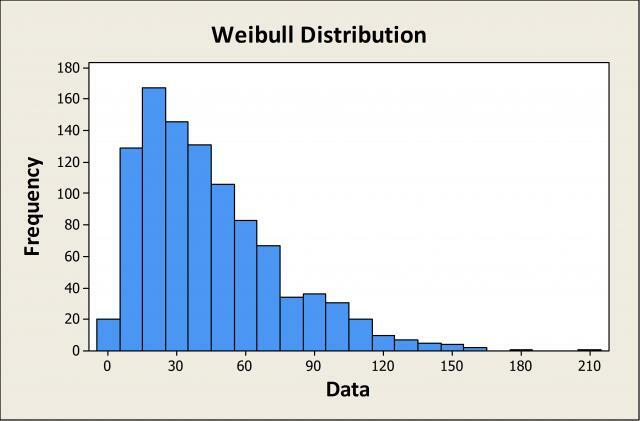 Using Minitab’s Calc > Random Data > Weibull menu, we can randomly sample data from this Weibull distribution. We can then use Calc > Row Statistics to calculate the average of each sample. Suppose we collect a sample of size 5 from that Weibull distribution above and compute the average of those 5 numbers. Then we repeat this process, say, 300 times. 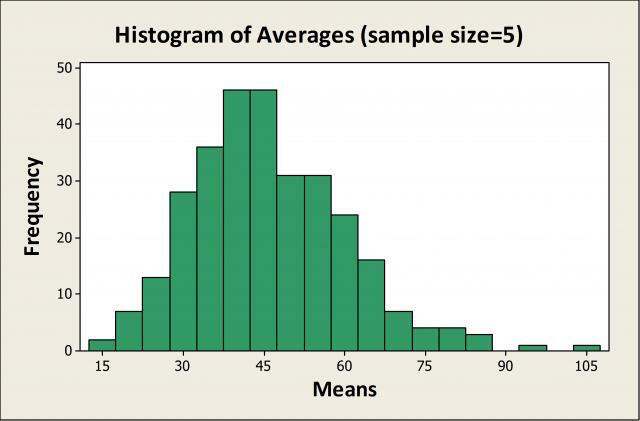 Looking at the green histogram of those 300 averages, we can see the sample means do not appear to follow a normal distribution. Rather, the means are skewed to the right. Suppose we then collect a sample size of 50 from that same Weibull distribution and compute the average of those 50 numbers. Then repeat that process 300 times. 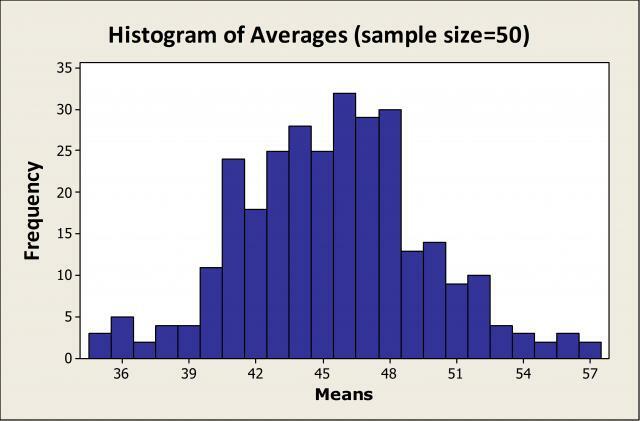 We see in the purple histogram below that the distribution of those 300 averages does in fact resemble a normal distribution.